Brian Czech and the logic of the steady state economy | Growth is Madness! Our physical growth will have to stop. It’s unsustainable. The earth is finite after all. That’s indisputable, isn’t it? Listen to Brian Czech talk about it in this radio interview. (You’ll need either to download it as an mp3, or to listen to it as a RealAudio file. For the latter, if you don’t have the RealOne player, just download Media Player Classic which is less problematic anyway and plays the same files.) Czech is the president of the Center for the Advancement of the Steady State Economy and author of Shoveling Fuel for a Runaway Train. He has established himself as an important figure in ecological economics, taking on the neoclassical economic model and macroeconomic theorists and their propaganda advocating limitless economic growth. Economic growth, as Czech points out in the interview, involves a physical element. Now that’s a problem. It’s that indisputably unsustainable element. There is, says Czech, a “fundamental conflict between economic growth and environmental protection.” What’s more, large numbers of scientists from an array of disciplines have said we’ve reached the limits of growth. Czech says, therefore, what few others dare to — that we need an end to economic growth as we know it. (He carefully distinguishes between economic growth and economic development which involves qualitative rather than quantitative growth and so is not subject to the same limits.) As an alternative he offers the model of the steady state economy, an idea popularized, in part, by Herman Daly. Clearly, the ecological economics approach to an economy is sustainable. The the conventional, neoclassical approach is not. The interview last 37 minutes. Try to listen at least to the first half. It’s well worth it. Image source (minus added text): markg6, posted on flickr under a Creative Commons Attribution 2.0 license. 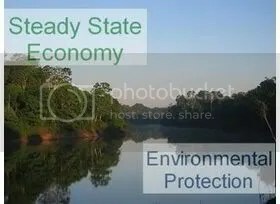 This entry was posted in Brian Czech, Ecological economics, Ecology, Economic growth, Economics, Ecosystem, Environment, Steady state economy, Sustainability and the Big picture. Bookmark the permalink. heh, last message is messed up for some reason. [Administrator’s note: I deleted it.] Anyway I was saying that I love educational mp3’s cuz they make the long drive to work productive instead a complete waste of gas and time! Yeah, it’s a pretty good interview despite some sound interference. Good for a long drive. 🙂 Brian Czech sent me some links to a few different videos, and I’ll likely feature a couple of those in future posts. One contains a nice outline of the rationale for the steady state economy, and lays out the concepts and their foundations very clearly. Decided to have a canoe race on the Missouri River. Management was formed to investigate and recommend appropriate action. Boat, while not enough people were rowing. Superintendents and 1 assistant superintendent steering manager. Other equipment, extra vacation days for practices and bonuses. Team was out-sourced to India. Can’t make money paying American wages. In losses. GM folks are still scratching their heads. Don’t even think about Ford…..
Pingback: Conservation groups speak out on problem of economic growth, and you can too! « Growth is Madness!